By Tae Thongsri, this casual off-the-shoulder cotton tunic is elegantly embellished with wrinkled pleats on the chest and upper back. It is tied over the shoulder with strings and closes with six coconut shell buttons in the center. 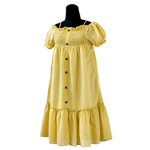 This piece of clothing may vary slightly in colors, motifs, weight and size. Color discrepancies may occur between this item and your computer screen. Sizes available: XL to S - Make sure to select your size from the Size drop-down located above. This item was designed and crafted by Tae Thongsri. Tae was born in Phitsanuloke Province on September 26, 1968 in a warm farmer family. 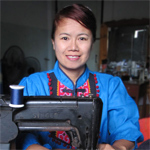 Her mother and her grandfather taught her how to make clothes. She started out by making clothes for her doll but then she began to make clothes for herself and has been doing so ever since. After graduating, she came to Chiang Mai and began teaching English at a technical college. During her free time she kept making clothes and also began to make jewelry as a hobby. She resigned from her job in 2012 and started to make clothes and jewelry full time. "Even though I love teaching, I realized that after doing it for 20 years I was not going anywhere. I guess this would probably have happened working for anyone else and I was more than ready to resign in 2012 and start doing what I really wanted for myself. I don’t know how well it will work out but I don’t really mind because I know I will feel fulfilled doing what I love best. I hope my creations make women look beautiful and feel confident by looking different," says Tae. ... Read Tae's full biography on Ezistock Blog.